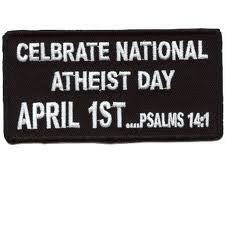 Psalm 14:1, which begins with, "The fool says in his heart, 'There is no God'," is often a text cited by Christians when speaking against atheism. But, while this verse certainly has a valid application regarding atheists, I wonder if we do not regularly overlook the wider point of Psalm 14. Christian brothers and sisters, doesn't it gall you when someone says he or she is an atheist: when someone enjoys the beauty of nature, yet refuses to acknowledge the Creator; when someone enjoys telling people what they 'should' do (using the moral imperative), yet refuses to bow before the Moral Lawgiver; when someone enjoys the comfort of loving relationships, yet refuses to pursue the One who is Love? Isn't it obvious that the atheist is a fool? BUT, lest the above reflection provide a pretext for pride, consider: in your natural state (Eph 2:3) YOU are a fool as well. Apart from the grace of God, we ALL are fools. Psalm 14 begins with the phrase, "The fool says in his heart, 'There is no God'." Note that it does NOT say, 'The fool says in his mind...' It does not seem that this Psalm is written primarily as a polemic against a philosophical movement. A person may say "There is no God" in his or her heart even if he or she would never dream of saying this statement aloud. A person may say "There is no God" in his or her heart even if he or she never thinks these exact words. This is because the heart of sinful people is bent against God: sinners desire fleeting pleasures and self-recognition, and do not submit to God and seek God's glory. In our natural state (Eph 2:3): who understands spiritual matters? The answer comes: "No one." Who seeks God? "No one." Who does good? "No one... not even one." On the other hand, "All have turned aside; they have together become corrupt." And even believers-- those who have been rescued from this natural state by the Holy Spirit-- when we sin, we act as if there is no God: we act like fools. This is the good news of the Christian faith: as Jesus suffered and died on the Cross, the One who is Wisdom took on the penalty for our willful ignorance; the Savior took on the penalty for our defiant lostness; the One who is Good took on the penalty for our badness; the One who always did the will of His Father took on the penalty for our straying; the One who is perfectly pure took on the penalty for our vile corruption of morals and conscience. Jesus rose from the dead-- showing that He is victorious over sin, death, and Hell-- and now He lives, offering eternal life to all who turn from their sins and believe in Him.